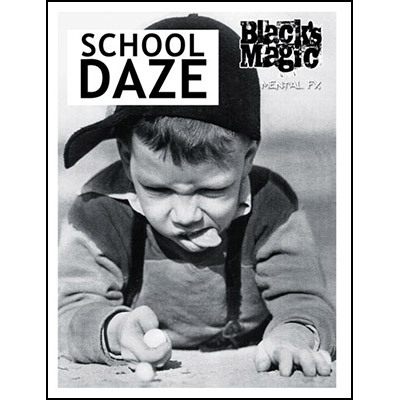 Discount Magic - School Daze by Black's Magic. School Daze is predominately a two-phase mentalism or mental magic effect for close-up performances that uses the game of marbles as the patter justification. For those who prefer visual magic, a few bonus routines have been included for you to enjoy. Phase One: The performer pulls a small bag out of his pocket and pours t he contents into his hand. Addressing the spectators, the performer tells them the story behind how he came into possession of the m and proceeds to allow one of the marbles to be chosen by a member of the crowd. He then instructs another to join in and tells them to decide among themselves who will hold onto t he marble, but to not tell him. He turns around, and when they are ready, he returns and after a few questions, accurately tells them who has the marble. Phase Two: This event is repeated, but this time the performer tells the spectators not only who has the marble and what hand it is in, but does so without asking any questions whatsoever. Comes complete with a black velvet draw-string bag, five differently colored cat's eye marbles (plus one duplicate), a steely and instructions. A great trick but when supplied with the mystery set a certa ..
School Daze by Black's Magic School Daze is predominately a two-phase mentalism or mental magic effect for close-up performances that uses the game of marbles as the patter justification. For those who prefer visual magic, a few bonus routines have been included for you to enjoy.